I have visited Muhammad around sixty times. But it is only now that we begin to really talk to each other. Seven years ago, I met Muhammad for the first time. I was then out on one of my long weekend walks. Muhammad came towards me, pointed towards the olive grove and presented me to the long gray dragon that was approaching his house. At the time he did not know whether the wall would go east of the house and let him belong to Jerusalem with all the practical benefits, or if it would go west of the house, and forever shut him out of Jerusalem. It was a lottery with a winning ticket and a losing ticket. Bu he could not even pick his own lottery ticket. Some other people decided over his future. Then he spoke about the dragon that was approaching, the dead dragon that devoured everything, and that would soon devour him. Over a long period of time, we came to meet several times each week. We sat on his porch when the dragon passed and lay down heavily in front of his house. The dragon that shut out the light, which meant that the sun set already at three p.m., making the view over the old city disappear. For him, it meant that everything died: plans, dreams, and a possible future. “Recently I was someone,” he says again. He says it with heavy and sad eyes. I had just thought about leaving. I had completed my visit. I wanted to return to Jerusalem. I was going to the American Colony in the evening. But I stayed and began to listen to someone who no longer felt that he was somebody. Muhammad tells me that he recently owned a white horse. He says, “I had it when we who were in Abu Dis were entitled to all land between Abu Dis and the Dead Sea, north, south and west. Mats, you have an Audi; I had a white horse. The white horse could be several kilometers away, he was completely free, but it always followed me with his eyes. At the slightest movement or sound, he came running back. Everyone knew that this was Muhammad’s horse. Somehow, he followed me and I followed him. We were both free. Muhammad’s old father enters. He would usually sit crawled up in bed and watch TV. When I seven years earlier saw him for the first time, he sat leaning against a chair in the garden, guarding a few sheep. 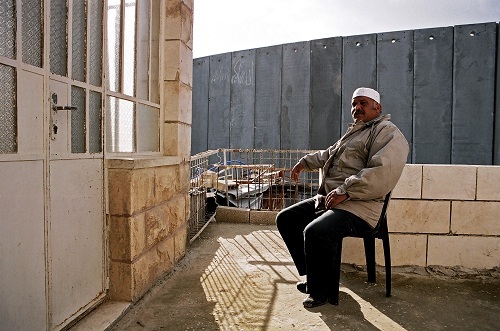 Behind him, the wall that Palestinian workers were building was quickly approaching. I then saw a man with a tired body, worn clothes, and crooked legs. I thought I understood. I imagined what a shepherd looks like. He matched that image very well. Now I find out that in the 1940s he belonged to the Jordanian army. He was in Jerusalem on the Jordanian side when Israeli terrorists murdered Bernadotte. In detail, he tells for the first time how it happened. I listen and do not know what to believe. When I later on that evening read about the murder of F. Bernadotte, most of what the old man had told me makes sense. Then the old man begins to talk about being free. Before he became trapped behind the wall in Abu Dis and after he had left the Jordanian army he made a living by buying animals in Yemen, Jordan and Syria. 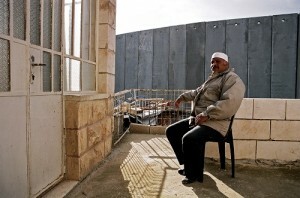 He was constantly traveling and returned with animals that were sold in markets around Palestine. I had had prejudices about him the same way that I had had prejudices about almost everything surrounding the occupying power and the occupied. I worked at the Swedish Consulate for two years. Every week I met Muhammad. But I had to leave him for an extended period of time and return for him to think it was important to talk about his innermost thoughts, about his constant longing, yearning for freedom, for a white horse. He wanted for our conversation to be meaningful. He says that he is no one today, but that he was once someone. Within myself I can no longer push aside my own questions. Who am I? Am I someone? What do I do with my freedom? Muhammad told me about himself. Can I tell him about myself? “We have lost our land, our trees, our water, our work, our freedom and also our dreams.” Before I leave him, he asks me if I think I am going eat meat tonight. “I think so,” I say. “It is long since I ate meat,” says Muhammad.